Heading back out of Virginia the morning after my presentation to the Virginia Beach Genealogy Society, I spotted the following advertisement for Tactical Distributors.com in the airport there. 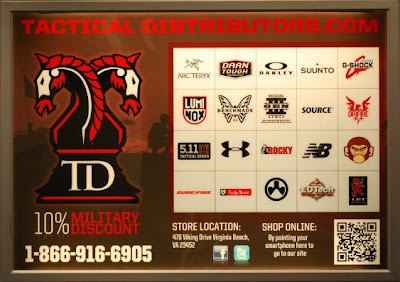 And, sure enough, tucked in amongst the logos of the companies whose goods they carry were a couple of heraldic ones. 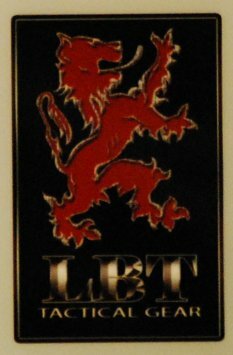 while the more heraldic one (if you ignore the violation of the rule of contrast, that says “color shall not be placed upon color,” and red on black is color on color) (LBT Tactical Gear) is simply displayed on a rectangle (Sable a lion rampant to sinister gules). There is also the one that doesn’t jump out at you - at first - but which I thought had the most innovative combination of heraldry and logo. 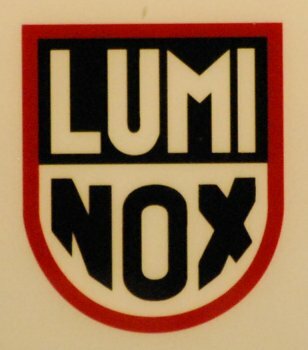 It’s the logo for Nemo, which is the letter N designed to look like a shield with a bend on it. Now, how cool is all that?